Vegetarian ceviche that’s really good! It’s always fun to run across a recipe that my vegetarian daughter might like. I think this one qualifies. 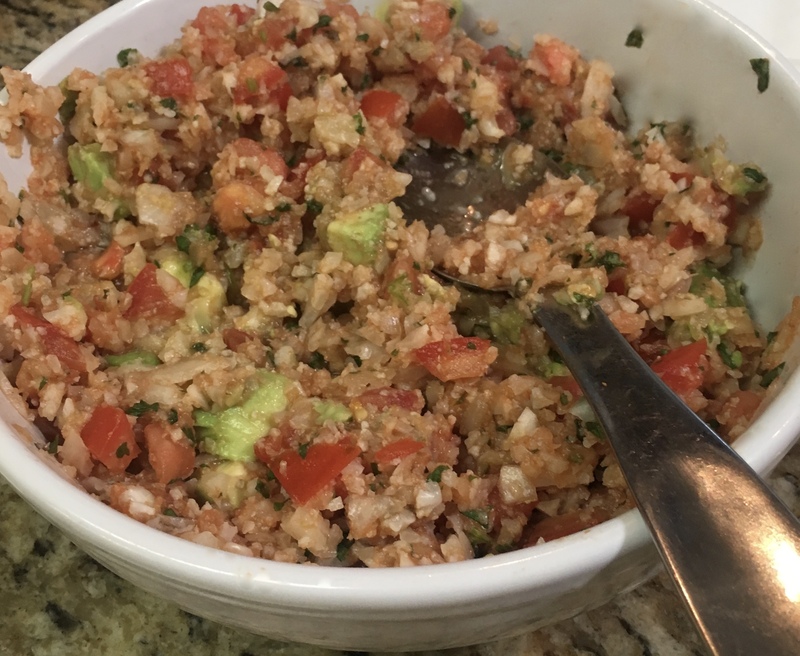 It is a vegetarian ceviche made with cauliflower instead of sea food. I took it to a Thanksgiving dinner as an appetizer. A couple of people asked me what kind of seafood was in it. I had to convince them that it was all vegetables! In a large skillet, bring 1 cup water to a boil. Add cauliflower; cook uncovered until crisp-tender – 5 to 8 minutes. Drain, spread out and blot pat dry. While cauliflower is cooking, mix together catsup and orange juice. In a bowl, combine cauliflower with tomatoes and onion. Add catsup and orange juice mixture, cilantro, salt and pepper, toss to mix well. Refrigerate at least one hour or overnight. Before serving, gently stir in avocado cubes. Serve with tortilla chips, lemon wedges and optional hot pepper sauce. Note: I had to mess with it a little, of course. I prefer lime juice and lime wedges over lemon for this dish. I found it to be a little too sweet for my taste, so I added the juice of a lime when I added the avocado cubes. It might be good to compare the sugar in various brands of catsup and use the one with the lowest sugar to start out with. I had leftovers, and I had to experiment a little more. I picked up a handful of shrimp, boiled, peeled and chopped them and added them to the “ceviche.” I honestly couldn’t tell they added anything to the recipe. It stands alone with the cauliflower and I’ll be making it again soon.